At Designhill, we have always appreciated graphic designers for their attention to detail, their can-do spirit and their ability to win. Therefore, to encourage them and help them earn more, Designhill keeps launching new products and services every now and then. Recently, Designhill launched its one-to-one project that allows graphic designers to collaborate directly with clients from across the globe and work on a one to one basis. This amazing design project is an innovative concept that gives an opportunity to designers to earn extra, make their portfolios stronger, expand their client network and grow their skills. One-to-One project has created an additional stream of income for designers beside regular design contests launched at the platform. And in order to bring smile at the faces of Designhill’s graphic designer community, the company is providing yet another opportunity to avail lucrative rewards. Now, designers registered with Designhill can upgrade their membership subscriptions and multiply their rewards and benefits manifold. More Earnings For Designers – With every membership upgrade, Designhill will reduce its commission and you will get to earn 5% more on each contest you win! If you upgrade your membership from Normal to Silver, you will get to earn 5% more each time you win a contest. If you upgrade your membership from Normal to Gold, you will get to earn 10% more every time you win a contest. 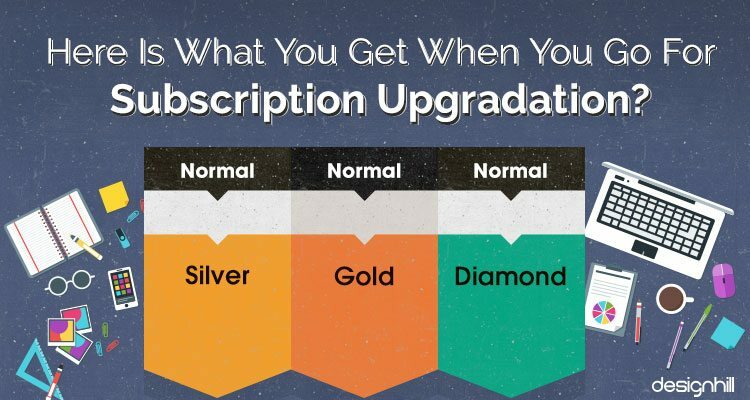 If you upgrade your membership from Normal to Diamond, you will get to earn 15% more every time you win a contest. Designers Will Get More Star Points – With every membership upgrade, you will get more DH points as the multiplying factor will increase with each upgrade you go for. DH points help you improve your rankings on the Designhill platform. The higher your designer rankings is, the more paid invites worth $20 each you get to earn from clients. In addition, with a high ranking, you get to earn more followers, suitors and admirers who would eventually collaborate with you on some design project. Normal package helps you earn 1 DH point for every star rating you get on your designs. With Silver packages you get to earn 1.5 DH points for every star rating on your design. With Gold packages you get to earn 2 DH points for every star rating on your design. With Gold packages you get to earn 5 DH points for every star rating on your design. Become a Featured Designer – Every membership except the ‘Normal’ subscription package comes with the benefit of becoming a Featured Designer. Featured Designers command special stature and are featured at the website. They also get to avail special benefits at the platform. Get Featured on Designhill Blog – By upgrading your membership to Gold or Diamond, you will get a rare opportunity to be featured on the Designhill blog. The blog is followed by over 50,000 visitors every month. Visitors to the blog also include startup founders, small business owners and business influencers. Getting featured on Designhill blog can help you grab work opportunity from clients from across the globe. They may even follow you and eventually collaborate with you for their future design projects. Remember, most people do their fair bit of research before spending money on a service, be it sourcing a custom logo design or getting a website built. And getting your name on featured articles at Designhill Blog will help you create that first killer impression on your prospective clients. Becoming a globally renowned designer is one of the major benefits you get to enjoy when working with Designhill. Reduce Commissions – To give you that extra benefits, with every membership upgrade, Designhill will slash its commission on logo store sales. For Silver packages, Designhill will charge 35% commission for every sale. For a Gold package, Designhill will charge 30% commission for every sale. For the Diamond package, Designhill will charge 25% commission for every sale. With so many benefits of membership subscription upgradation, we are sure that you would not like to miss out on the opportunity to save big as well as stay ahead of the curve. By just subscribing to Designhill’s Gold, Diamond or Platinum packages, you will get to enjoy more projects and more clients. So, what are you waiting for? Upgrade your membership now and get set to enjoy the results. They are magical, really! Last but not the least, designers with the best portfolio of the year will get to become eligible for winning multiple rewards. This is like an icing on the cake. So if you still haven’t create your portfolio at Designhill, create one now. Create Your Designer Portfolios Now! Next Next post: How Can Business Owners Get Most Out of Designhill’s One-to-One Projects?